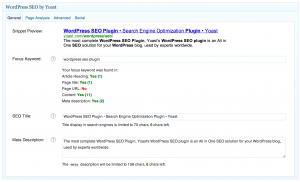 About two year ago I posted an article recommending some WordPress plugins. Well, times change and two years is a long time in the world of tech, so I thought it might be good for us to take another look. Some of the plugins I recommended then I’m still recommending now. I’ve replaced a few, for one reason or another, with different plugins that serve the same purpose. There are others that fill new shoes that didn’t need filling back then. I’m not covering any security plugins here since we’ve covered those plenty recently. Ad Injection: There are all sorts of plugins available to help you place advertisements on your site. Over the years, we’ve tried quite a few–but for about the last year or so we’ve been using this. We like Ad Injection because it’s robust and offers plenty of configuration options without being too complicated. It also works well with a variety of ad sources and can be used with pay-per-click services such as AdSense or with affiliate networks like Linkshare. It can be setup to place ads at different locations within your posts or pages, and can also place ads in sidebars and other locations through the use of widgets, depending on your theme. WP-Optimize: This is an easy to use utility for keeping your WordPress database cleaned up. Keeping the database optimized will not only save space, it will help your site load quicker. After installation, you’ll just need to open WP-Optimize every now and then to see what it has determined needs doing. It doesn’t try to do anything dangerous that can hose a site or anything, so we generally let it do everything that needs to be done. Of course, you’re advised to back-up your database before using it, just in case. WP-Optimize offers options to remove post revisions and auto draft posts, clean marked spam and unapproved comments as well as optimize your database. A database optimization chart shows what changes will be made and how much disk space will be saved in the process. How often you need to run WP-Optimize mostly depends on how often you post or delete content on your site. For example, while writing this I looked at one of our sites where we haven’t been posting a lot of new content. On that site, we haven’t optimized the database in about a year and running the program would clean-up about 44 Kb. Here on FOSS Force, where we post quite a few more articles with multiple revisions, we last optimized the database only three weeks ago and if we were to optimize again today we’d save 73 Kb of disk space. P3 (Plugin Performance Profiler): This is a really good utility plugin to keep handy. It analysis how your site loads and returns useful information, such as load time and server load, converting them into easy to read graphs. As the name implies, this plugin is most useful for detailing how much time and server load is consumed by each plugin you have installed on your site. This can be very useful when you’re trying to diagnose any performance issues your site might be having. The interface isn’t entirely intuitive and it’s a little rough around the edges, but on several occasions it’s saved us a lot of work as we’ve sought to find the bad player among plugins on a WordPress installation. WP Super Cache: If you don’t use WP Super Cache, you need to use some caching program on your WordPress install. In case you don’t know, I’ll tell you why. 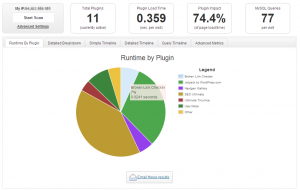 Like nearly all content management systems, WordPress loads pages dynamically. This means that every time a visitor asks for a page from your site, your server get’s busy finding and serving all of the different components that make up your page. Let’s look this page you’re reading as an example. When you clicked on the link that brought you here, our server had to first find and download our header graphic and then create the menu bar below that. Then it had to find the ad serving widget and get instructions on how to serve the uppermost ad. The server had to work to put together the basic layout of the page. In each of the side columns, the server had to load each of the widgets. On the left column alone, that would mean loading a total of six widgets–and, of course, it would have to bring this article out of the data base, insert commercials, comment fields and all that. On most WordPress sites, every time a visitor calls for a page, thirty to a hundred calls to the database are made. This isn’t too awfully hard on your server as long as you don’t have much traffic. But what if you have a high traffic site? Or what if suddenly an article you’ve posted becomes big news over on Reddit, sending hundreds or maybe even thousands of visitors to your site all at once? See the problem? When you use a caching program like WP Super Cache, the first time a visitor asks for a page like this one, a copy of the HTML that’s sent to that visitor’s browser is saved. Then, for the next specified amount of time, usually an hour, all subsequent visitors who ask for that page are served the HTML copy, eliminating nearly all database calls and greatly reducing your server’s workload, meaning it can handle a lot more traffic without tumbling down. I’m no expert; I’m just a self-taught webmaster, but I believe WP Super Cache is the best caching plugin available for WordPress. It can be a little complicated to figure-out if you’re a newbie, but the instructions are clearer than you think. You’ll get it. 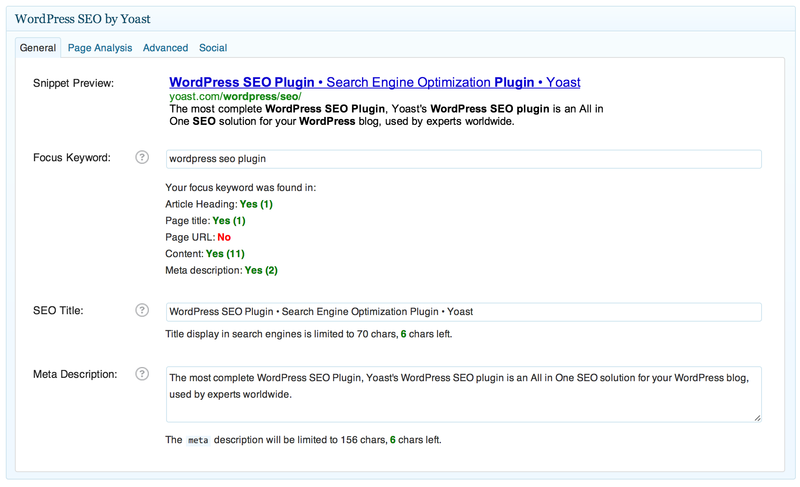 The WordPress SEO plugin general meta box. You’ll see this on edit post pages, for posts, pages and custom post types. Click to enlarge. WordPress SEO: If you’re just starting your first blog or website, you’re going to have to get familiar with SEO or search engine optimization. You’re going to hate it, but you’re going to have to get familiar with it, unless you don’t care if no one reads your stuff. An SEO plugin attempts to do exactly what you might think. It tries to optimize your site so that the likes of Google and Bing notice it and decide that the article you wrote on preserving skunk grass in the wild goes to the top of the list of articles on skunk grass in search results. We’ve tried a few of these plugins, including SEO Ultimate, considered by many to be the Rolls Royce of SEO plugins, but we settled on WordPress SEO. It works very well, it doesn’t try to do too much and it comes with great documentation that details why certain steps are necessary to increase your site’s visibility to the search engines. It also integrates into the your edit post pages, where it functions as a valuable tool for tweaking your posts to make them more likable to Google and Bing. After we installed and configured SEO Ultimate on FOSS Force, we saw our search engine traffic more than quadruple almost immdeiately. Next Tuesday we’ll talk a little bit about some problems that might arise when using plugins, how to avoid them and how to deal with them when they happen. I also recommend P3 Performance Profiler. Its one of the easiest and quickest ways to see which plugins are slowing down your site. From there you can deactivate these slow plugins in favor of alternatives. @Lorenzo I wholeheartedly agree with you. Several times now it’s saved us a bit of trouble when we were trying to find the guilty player that was slowing a site down. I didn’t cover All in One SEO pack because I prefer WordPress SEO, which I did cover here. However All in One is a popular SEO solution, that’s for sure. OMG, reading your entry about Ad Injection made me realize that I haven’t disabled AdBlock for your site! I usually keep AdBlock on and disable it for sites I like and want to support (unless their ads are really intrusive). As you can imagine, I have very mixed feelings about AdBlock. On one hand, as a free software advocate, I completely understand why folks want to turn off all advertising and browse in piece. On the other hand, we spend a lot of time, energy and thought trying to keep this site thought provoking, informative and (sometimes) entertaining–and the ad revenue is the only income we’ve got to keep the bills paid. I like you’re solution of turning on the ads for sites you want to support. And I’m honored that you like what we’re doing here enough that you’d put-up with our ads while you’re reading what we have to say. Methinks you’re a good guy, Ricardo! Yeah, I certainly didn’t come up with the idea of using AdBlock and disabling it for sites I like (I think I saw it first talked on osnews.com) but I think it’s a good way to help those sites. Actually, I’ve only started using AdBlock a year or so ago, before that I blocked specific intrusive ads but it was becoming unmanageable.